Rest well: It's Labor Day! We'll all miss summer, but there are a lot of games to look forward to this fall. To start your long weekend, here are some of the most interesting things I read this week. -You have to read Chris Dahlen's interview with Jonathan Blow in the A.V. Club. Blow is such a fascinating guy. I guess he rubs a lot of people the wrong way, but I think with Braid he's earned the benefit of the doubt. When I read interviews with him, I get the impression that he really has sat down and thought about everything he's talking about. And I think it bothers him that other people don't do the same. -Speaking of interviews, you may remember that Mike Walbridge interviewed me awhile ago for a piece he was working on for GameSetWatch. At his personal blog, he's posted a longer entry about that interview and others. My suspicions have been confirmed: I am a boring conversationalist. That's why I write! -Bill Harris wonders what's up with 1up.com's review scores. I don't know why I thought they were one of the tougher graders out there -- maybe because they do such a good job with features -- but it turns out they're the most lax! I thought IGN had that honor. Also surprising is that Gamespot is the toughest reviewer of the biggest sites, particularly given Gerstmann-gate. -Tom Chick lists the 10 most ridiculous lines of dialogue from Too Human. Although you could pick any 10 lines at random from the game and it would be equally silly. What are your gaming pet peeves? 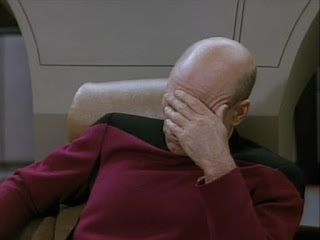 Above: Captain Picard has just lost 20 minutes of his life due to spaced-out checkpoints on the Holodeck. Yesterday I mentioned that one of my three biggest pet peeves is a bad game camera. In comments, Quinn wondered what some others were. In a bit more detail, here are the 3 things that drive me nuts in any game. A bad camera. This problem has largely gone away in recent years, as most games let you control what you're looking at. And some games, like God of War, implement an external camera pretty well. But nothing's worse than when you're running along and the point of view suddenly shifts, completely throwing off your sense of direction. Well, maybe one thing's worse: staring at a giant wall between your eyes and the action. Sparse save points and checkpoints. It's not so much about the difficulty factor, although it does bug me to lose 10 minutes or more of progress because I've failed to reach a checkpoint. This stuff really bugs me because I want to be able to start and stop my gameplay session according to my own whims. I don't want to traipse across a level for 20 minutes looking for a save point. I don't want to have to keep slogging ahead, waiting for the little "checkpoint" message to appear, before I can go to bed. That's not a comprehensive list by any means, but any time I come across any of these problems it's like hearing the needle scratch off the record, even in an otherwise good game. There's just no reason for any of them. What about you? What in a game drives you absolutely batty? A similar phenomenon has afflicted an awful lot of 8-bit remakes, for reasons I don't understand. They can't -- or won't -- properly replicate the NES experience. A few years ago, I was playing the Mega Man Anniversary Collection for the GameCube, where the developers had swapped the functions of the two buttons. They mapped firing to the A button, and jumping to the B button. This is exactly backwards. When I remember about playing those simpler NES platformers is that all of them worked the same way. You hammered your knuckle on the rightmost button to jump, and fired your weapon with the tip of your thumb. This was an ideal arrangement. The leverage of your thumb allowed rapid-fire button presses for the main action without sacrificing the more deliberate pace of most jumping mechanics. Why do so many remakes reverse the button positions? Partly, I think it's a rudimentary mistake: on the original NES pad, the B button was on the left and the A button was on the right. 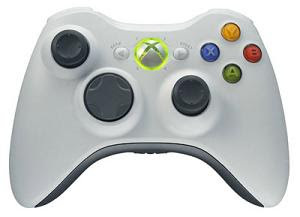 On the Xbox 360 pad, the A button is on the bottom, and the B button is on the right. Keeping the same button assignments results in a reversal of their positions. This is a bigger deal than it might seem like, and not just because it made such an awkward experience out of Mega Man 2, which I was playing for an audience. It comes down to user experience and expectation. There is a temptation among tech people sometimes to blame their users when the users have trouble with a product. Although this is sometimes true, most of the time it's because the designers didn't do their homework with regards to usability. The Web usability expert Jakob Nielsen likes to say that website designers ought to do the same thing as 90% of their competitors, because that's what users have come to expect. They have learned to navigate web pages in a certain way. It's the same with games. An Xbox 360 user playing a platformer will expect the A button to make his character jump. If you're going to deviate from the norm, you'd better have a damn good reason. This isn't to suggest that progress isn't desirable. When a change in control is worthwhile, then it's going to happen. Ten years ago, any racing game you played assigned the gas pedal to one button and the brake pedal to another (mapped to a modern day 360 pad, you'd probably go with A and stop with X). Today, these functions are assigned to the analog triggers in nearly every game, because that's a better way to do it. * User expectation has kept pace. Nobody picked up Burnout Paradise and pressed the A button to accelerate. Too Human shows some of the pitfalls of going your own way. Users expect to be able to manipulate the game camera in a 3D platformer by using the right analog stick. But Silicon Knights had a different approach in mind for their dungeon crawler, and instead assigned the right stick to melee attacks. It's an interesting choice. I don't want to knock it simply because I wasn't used to it. In fact, it wasn't even that hard to get used to, and works pretty well in some ways. The question is: Is what the developers gave up with this new approach equal to what they gained? I'd have to say no, and not just because poor game cameras are one of my top 3 videogame pet peeves. While the melee action does what it's supposed to, using firearms is practically impossible. Cycling between enemies doesn't work too well, especially when the boss you're trying to shoot at is standing behind grunts. That's a pretty big part of the combat. Standards become standards for a reason. Nothing is beyond revisiting, of course, but it's not helpful for 90% designers to eschew decades of user expectation because they think they've found a marginal improvement. Maybe Too Human wouldn't have been the same game if it copied the control scheme from God of War, say, and had you press the X button to attack and use the right analog stick to dodge. But one of those games relied much more on the user's built-in expectations -- maybe it's only coincidental that it was the much better game. *Another excellent example is EA's Skate. They took a completely different approach to videogame skateboarding than did the Tony Hawk series, and it was a stroke of genius. **John Barleycorn points out in comments that you can remap Bionic Commando's buttons, if you want to. This is always the best solution. Even so, the default configuration ought to be the most familiar one. Autumn is in the air. You can feel it in the crispness of these late-summer mornings, see it in the fading sunlight. Most of all, you can hear the rumblings of the fanboys gearing up for what is sure to be the best/worst holiday shopping season EVAR! For all the interesting and enlightening downloadable games we've been fortunate to play over these past couple of months, come September it's all about going bigger, better, and more badass. It's about pushing graphical limits. It's about increasing the player count in online shooters. It's about picking one game to buy and defending your choice on any gaming message board you can find. Some folks have already decided: the game for them is Star Wars: The Force Unleashed. And as always, they've taken to the Gamestop.com user-submitted preview page to tell you why. 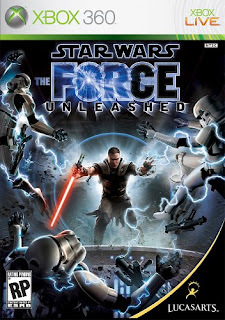 This game looks so cool because u can pick up stormtroopers and they'll hold on to stuff to stay in their spots i reserved it last week and i am ready for the force unleashed omg just buy it you'll love thats y im buying it and u can throw them through windows and use lightning if u played other star wars games ur like its okay but this is worth a perfect 10!!!!!!!!!!!! Unraveling the parallel thoughts running through that comment is like listening to one of Bach's many-layered fugues. If Bach were tone deaf, that is. It will not just be a random flick and you slash. I have seen every video possibleabout this game, gone to the official website, saw the control scheme, heard the control scheme from a creator of the game. i've done all the research possible and the lightsaber will bemotion sensitive. I guess "all the research possible" didn't include Googling this game, which reveals that IGN -- among others -- reports "all combat being centered around the Wii remote's left, right, up, down, and stab motions." Or, you could also say, you flick the remote and you slash. This will be the best game for the Wii so far by a mile. Star Wars has had some good games with pretty realistic gameplay such as Star Wars Episode III for the XBox and the Playstation but now that Lucasarts has seen the Wii, they realized the full potental of a Star Wars game. The game will be played with the Wii remote as your lightsaber and using the nunchuck for force moves and movement throughout the complex and amazingly detailed world of Star Wars. The new programs that run the game will combine to create the best quality of gaming you have ever seen and I am glad to say that Star Wars is coming out with the game of the year. It's about time someone came out with realistic Star Wars gameplay. I've yet to play any game set in this universe that accurately simulates the feel of bull's-eying whomp rats in my T-16 back home. I'm sick of them dumbing this stuff down for the game-playing audience. One thing i do not like about this game is that when you hit someone with your lightsaber they just fall. I mean come on, your body would be cut in half. They need to make this game rated M instead of T. It's a big turn off when you just hit someone and they just fall over. Ok so the demo was great! ... Now the one thing I don't like was that when you slash at someone wit your lightsaber they just fell, in Star Wars Jedi academy 2 their lims fell off and that game was rated T. im not even asking for blood (which there should be plenty of) but give me something. I'm not asking for it to be violent; I just want to see blood, guts, and dismemberment. Although I've got to agree with these guys, to some extent: Imagine if you could use the Force to pick up a disembodied arm to slap around your foes! That would be awesome. I played this game on ps3 and it was sweet! There's barely anything that i hate. You can't hate this game. It took a while to download, but it was definitely worth it! That's a quote I'd like to see on the Greatest Hits edition box: "There's barely anything that I hate!" How much do you think uchiha 73 usually hates? Finally, I want to leave you with the soothing words of "J.O.E." if i know i can unlock maul (others) i'm consider me buying ,and indursting it. ARE YOU???? thats gonna make alot,and sell alot . i like wii i've always loved nintendo! i really would a good vreus mode between sith &jedi option. i'm getting the game i like vaders appretence. he looks awesome yo man on real yo. please put the deulist mode for the ps3 ,and x-box. but better ,yo man do it . that's me joe.?! I'm going to read this until I can recite it from memory. Truly a masterpiece of avant-garde poetry. Here I go again, reviewing a game weeks after everybody's already done with it. Still, I was pretty happy with this Braid review, at least until I started reading other reviews of Braid and realized that I hadn't said anything new or particularly insightful. Gotta say, though, it seemed like most reviewers were inspired to try a bit harder on this one, which was nice to see. They tried to explain what the game means! Imagine that. No reason why similar scrutiny couldn't be applied to more games. Above: By looking at this logo, you've pretty much had the entire experience of playing the demo. Drunk on the possibilities of the summer of downloadable games, last night I downloaded the demo for Bionic Commando Rearmed. I'm not sure if I ever played the original Bionic Commando, and if I did it was probably on an emulator. Suffice it to say that this franchise is not one that holds a special place in my heart. The demo was going to have to convince me, on its own, whether Rearmed was worth a purchase. It did not do so. The demo does a few things well. The tutorial is right there to teach you the basics of the grappling arm. And I really enjoyed holding a conversation with another character through a system that resembled Metal Gear Solid's codec, in which he made fun of me for playing the demo instead of the full game. That's a nice touch. Problem is, there were maybe five minutes of playing time in the demo. You clear about two screens' worth of enemies before encountering a boss, who tells you he won't fight you unless you buy the game. This time, it was less funny. I hadn't had nearly enough time to get comfortable with the grappling arm, let alone begin to explore its possibilities. Then I can't even get thrown the bone of a boss fight? Weak. I can't even imagine why this thing was 347 megabytes. Compare this to the PixelJunk Eden demo. It contained the entire first garden, which by my estimate took a solid hour to hour-and-a-half to complete. That was plenty of time to be introduced to the game. I was able to get a full idea of its mechanics, and be seduced by its strange rhythms. I learned the elation of collecting spectra, and the crushing disappointment of missing a jump and plummeting to the garden floor. More important, Eden allowed me to accomplish something. It set up the goal of clearing the first garden, and then let me do so. Only after I'd associated the warm feeling of victory with the game did it dangle the prospect of even more accomplishments as an incentive to purchase the whole game. A cliffhanger in a demo can be tantalizing, but if it's too abrupt -- if it's unearned -- then the demo fails in its mission to entice me to play more. Guess which of the two games I'm considering plunking down the dollars for? Even when a demo works, as PixelJunk Eden's does, it's hard not to long for the heyday of shareware. When you downloaded the free version of Wolfenstein or Doom, you got an entire game. I must have played through "Knee-Deep in the Dead" dozens of times. It gave you several levels, numerous enemies, networked play, and all the weapons save the BFG. And it was free! Did I ever buy the other two episodes? Of course not. Maybe that's why you don't see shareware these days. A fascinating conversation has developed over at The Brainy Gamer in a post about non-gamers' reactions to Braid. There are a couple of disparate strands running through it, one of which is the old debate about whether great art needs to be accessible to a wide audience, whether anything accessible to a wide audience is therefore not art, and just whether the hell we're even supposed to be enjoying art in the first place. I'd first say that, at bottom, accessibility is irrelevant to questions of quality. I say this as a vigorous defender of Michael Bay, clearly the most skillful filmmaker of his type working today. Great art shouldn't pander to the masses, but there's no reason the snootiest, most discerning critic can't also appreciate great trash. Once you start wondering what other people will think about the game you're playing, you've taken leave of your critical senses. There seems to be a continuum of reactions to Braid, from people who liked and admired it, to people who admired it but didn't like it, to people who thought it was pretentious piffle. All of these are legitimate stances to take. If anything, the range of reactions and the vigor of the conversations about the game are a positive development. Even if people didn't like the ideas, they're engaging the game on that higher level. They're not dismissing meta-textual considerations as they so often do. That's a big step. Michael's concern is that when a game like Braid comes along -- a game that seems unique and maybe even important -- it still alienates non-gamers. If you've played it, then you know how hard Braid is. The problems it poses, and the solutions to those problems, all take advantage of the player's numerous built-in assumptions about how games work. Without those assumptions, you're sunk. This is what Nintendo has tapped into with the Wii. They've made games that people can pick up and understand immediately, without having to rely on a foundation of gaming knowledge that's taken decades to construct. But they're not really making games for those of us who do know these things. In the Brainy Gamer thread, I argued that Braid's time-altering techniques were much simpler than people seemed to be giving them credit for, comparing them to the similarly constrictive rules of movement that govern chess. I still think that's true. There's nothing overly complicated about a ring that slows down the timeline within a certain radius, or a doppelganger that repeats your movements. By the time you've cleared the first stage in any world, you understand the rules. What the level design does with those rules is astonishing, but it's always logical, fair, and consistent. The game doesn't cheat. I missed something important, however. For a non-gamer, understanding the temporal mechanics of Braid isn't the equivalent of learning how the pieces move in chess. A better analogy is learning to push the A button to make your character jump. Or that jumping on an enemy will kill it. Or that jumping on an enemy will bounce you as though you'd landed on a trampoline. The more you think about it, the more you start to notice all of the ingrained assumptions we have as gamers. It's even more basic than chess: for non-gamers, this is like learning the alphabet all over again. Michael laments that his non-gaming friends feel shut out by the very process of playing a game. He wants them to appreciate the artistic and dramatic possibilities of the medium, but how can they do that when they can't even use the controller? Ultimately, they're going to have to work for it. Hey, it takes effort to read a great book. It takes careful attention to watch a subtle, nuanced -- maybe even subtitled! 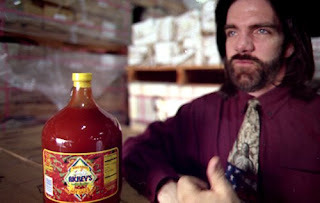 -- movie. Most of us couldn't do these things until we'd first read easier books and watched easier movies. We work to improve our appreciation for art because we know the results are worth it. Let's not overlook what did happen: these people gave it a try. I bet they wouldn't have done that a few years ago. What we're seeing here, I think, is just another sign that games have yet to achieve the level of cultural penetration people like Michael and I would like to see. That's okay. That's what we're doing this for. Give them a few more years. Above: Something happens, and doo doo doo doo. Well, in between sessions of Geometry Wars and Braid, I did find time to be totally mystified by Soul Calibur IV. Head-to-head fighters are a genre I abandoned long ago, and I found it next to impossible to just jump right back into it here. *None of them are NEPA award winners. 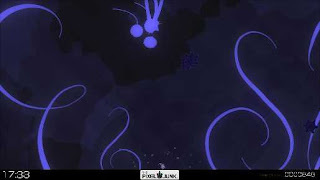 Above: PixelJunk Eden really doesn't look too good in screenshots. We may end up remembering 2008 as the year that downloadable console games finally took hold. They've been helped to this point by a lackluster slate of disc-based games -- the year's two highest-profile releases so far have met expectations, at best, and massively underperformed them, at worst. No, this year, if you want to play great games, you have to download them. I've nothing left to say on the subject of Geometry Wars 2. In fact, this weekend I made the difficult decision to delete it from my system in order to save both my productivity and emotional wellbeing. They say if you love something, you should set it free. But that freed me up to try a couple of other downloadable games I've been itching to play. First was the surprisingly robust PixelJunk Eden demo. I kept expecting it to cut me off. Instead, it kept sending me back into the first garden to collect more and more bright shiny objects. Others have expounded at length about this game's curious appeal, which was more than evident in the demo. Given my brief playtime, I don't want to say anything definitive. But it struck me just how unlike major releases this game seemed to be in terms of aesthetics and gameplay, and how stale most of the disc-based games I've played this year have seemed in comparison. And then there's Braid. What can I say about Braid? Very little, in fact, because I don't want to scoop my own review. I can say this: It's not the best game I've played this year, but without question it's the most original -- dare I say the most important? I don't know. Takes some time to sort out a question like that. In this moment, though, Braid certainly feels important. And it feels alive in a way that Grand Theft Auto IV, Metal Gear Solid IV, and any other bigger, better, and more badass sequel has yet this year. 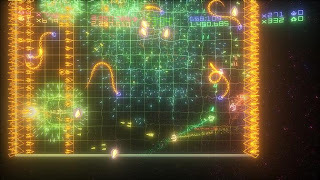 Geometry Wars 2 online leaderboards are live! Finally! This makes my armchair analysis of the Geometry Wars high scores much easier. A week ago, I looked at the top scores in Pacifism to try to get an idea of how they were distributed. Today, using the current Pacifism high scores, I'm interested in how much they might have changed in a week. Surprisingly, they haven't changed much. Number 1 a week ago was Xbox Live user Windforce Izumo. * Today, Windforce Izumo is still the best, although he's added 245,942,250 points to his score. He now sets the standard at 1,678,190,200. Our number 2 guy, Leaping, has the same score he did before. But in the interim, he's dropped to 4th place. The 5th-ranked player last week, Evil Mask, hasn't topped his best score yet either. The difference is that he's now 10th. And the guy who was 10th last week, Tyrak Stinger? Now he's 25th. What's happening here? It's similar in principle to the inequity we saw with the total distribution of scores. There seems to be more churn in the rankings the closer you get to the middle, but your relative ranking matters less. Dropping from 5th to 10th seems like a catastrophic decline, particularly as Evil Mask is now staring up at Windforce Izumo from a distance of over 660 million points. On the other hand, jumping hundreds or even thousands of spots in the line may be a matter of a few thousand points. For myself, last week I was ranked 15,236th. I blew away my high score, and as of this writing I'm ranked 2,591st, with a high score of 124,994,600. That's a big jump. But since I reached that personal high water mark, I've been steadily sliding back down the rankings. At first, my score was good for around 1,800th place. I've dropped over 700 spots without doing anything. There is this entire mushy middle ground on the leaderboards where success is even more relative than usual. I wonder if anyone else is having the same problem I am: I've stopped improving. For the first week or so, every session brought higher and higher scores. At some point, I hit a wall. The game no longer seems as fun when I feel like I should be posting better results with the same frequency I was before. Which is a shame, but it's the nature of the beast. Somebody needs to provide a platform for Windforce Izumo to stand on. *Last week, I referred to this user as "Windforce Azumo." I could have sworn that was what it said when I checked through Xbox Live, but at the time I was switching inputs on my monitor between the Xbox 360 and my PC in order to write the post. My apologies to him! Critics who write so everybody can understand everything are actually engaging in a kind of ventriloquism -- working as their own dummies. They are pretending to know less than they do. But critics who write for other critics are hardly more honest, since they are sending a message to millions that only hundreds will understand. It's a waste of postage. Ever since I wrote "Do readers want intelligent games criticism? Do writers?" I've been fighting this nagging feeling that I got something fundamentally wrong. There were some good points in there, and the question of why so many published writers need a blog to express their "true" voices is one that deserves an answer. But I didn't answer it. And I didn't get to the heart of the matter. The fact is, there is plenty of intelligent games criticism out there. Academics like Henry Jenkins and James Paul Gee crank out serious, high-minded looks at the mechanics of games that have nothing to do with assigning a "fun factor" and everything to do with expanding our pereceptions of what games are and what they can do. Guys like Ian Bogost and Simon Carless are on the front lines every day pushing for serious, independent games -- and game criticism. These may not be the most visible writers around, but they're not hard to find. And they're doing important work. What they're not doing, though, is writing for a general audience. They're not producing great essays that stand alone. And that's true of most of the best videogame writers I can think of. Don't misunderstand: Everyone I've mentioned, and everyone I'm discussing by inference, does great, valuable (even invaluable) work. I'm just saying that they're writing for a niche audience. You have to care about games before you can appreciate what they're doing. You have to know and understand things about video games that 99% of gamers will never think about. Think of them as the garage band that inspires the next generation of platinum-selling artists. They're helping to shape what we'll all be playing down the road. But what happens when game critics do write for a general audience? Yesterday, I spotlighted what I thought was some shoddy workmanship in an IGN review. Perhaps it was a little unfair to engage in that kind of drive-by criticism, so let me expand a bit. IGN does a great many useful things for your average gamer. They deliver truckloads of previews, reviews, screenshots, videos, and news on a daily basis. They do that well. What they don't do is write compelling criticism. And why should they? That's not their charge. It's also not where the revenue is. The last thing on their minds ought to be advancing game criticism as its own art form. They'd probably end up alienating their core audience. The problem here is the lack of separation between video games as a medium, and criticism of video games as a medium. What we still lack are the critics who can split the difference that Roger Ebert talks about in the epigraph to this post. No one has ever bridged that gap quite like the man himself. I don't need to be interested in a movie he's reviewing to want to read his review. I read Ebert, and I come away enlightened and entertained -- just as when I watch a good movie, or play a good game. Where's the middle ground? Where's the thoughtful, incisive criticism that is nevertheless accessible to a general audience? Where are the game reviews that are worth reading on their own merits? They're out there. I've lauded the work of Tom Chick before, and I think he comes the closest to what I'm talking about. The Escapist sometimes does, too. As usual, it's easy to identify a problem without offering a solution, or even -- as I just did -- pretending that extant solutions aren't sufficient. Ultimately, my aim is selfish. I love to play games. I love to read. I want to be able to love reading about games. Capcom is finally revisiting the classic with an updated version that takes everything that was good from the past, modernizes it, and then adds new layers of awesome. Never mind that the sentiment is trite and juvenile. "Awesome" is an adjective. The noun form is "awesomeness." Is it too much to ask for professional writers to get basic grammar right? You probably already have a pretty good fix on my opinion about this game, but why not click on over and read my full Geometry Wars 2 review? It's got metaphors and things. Sometime overnight, Insult Swordfighting served its 100,000th pageview. Well, not exactly -- I've been blogging since May 2006, but I didn't install StatCounter until December 2007. It's 100,000 pageviews since I started keeping track. Still, this seems significant. So I'd like to take just the briefest pause from raving about Geometry Wars -- although I'm sure as hell not done with that -- and say thanks to everyone who's stopped by over the past eight months, and moreso to those who have stuck around. I am especially to grateful to that small but invaluable cadre of regular commenters, whose ideas and insights have helped out tremendously. *You do not win a prize. Is he still prattling on about Geometry Wars? I wasn't prepared for the impact well-integrated leaderboards can have on a game like this. The first Geometry Wars Retro Evolved had them, sure, but you had to seek them out. And even then, having just one game mode reduced your chances of topping people. One of the great things about having six game modes is that you can have six different high score lists. When you hit a ceiling in one game, you can try something new. The constantly shifting scores are tough to take. All the scores are constantly increasing, but it seems like the rankings never change very much. I had a breakthrough in Pacifism this weekend, scoring 100 million in one game. That was good for second on my friends list, behind a guy with 106 million. Shortly thereafter, I blew past him and notched 124 million -- and tops on my leaderboards. I think I pissed him off. The next day, I logged on to find that he'd scored about 185 million. My overall ranking had slid by a few hundred spots in that brief span, as well. It feels like I'm walking up the down escalator. Yesterday was futile. I didn't come within spitting distance of 9 figures all day. For hours, I played and played and always that screen name and those 185 million points regarded my efforts dispassionately from the upper right-hand corner of the screen. I pondered deleting the first-place player from my friends list. Even I'm not that dishonorable. I am, however, thinking of installing the Geometry Wars hardware mod that Tom Chick recommends. Above: Not a picture of a high score list, but what can you do? We'll look at Pacifism mode, because that seems to be the one with the chance for the most ridiculously inflated scores. And indeed, the numbers bear that out. But the score list goes much further down than that. Exactly how much further, I'm not sure, but the lowest ranking person on my friends list is in the 55,000s, and the scroll bar icon next to my score is about one-fifth of the way from the top. This tells me I'm probably an above-average player, 80th percentile or so. My score of 18,690,325 is a good baseline to set as we look at the top of the list. The top ranked player, Windforce Azumo, checks in with 1,432,247,950! He's 76 times better than I am at Pacifism. Then comes the drop-off. 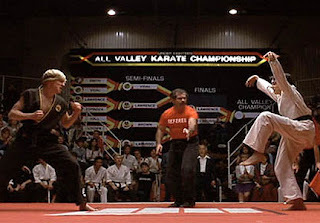 The number 2 player, Leaping, has 1,275,127,850. That's a difference of 157,120,100 points -- or more than 8 times more than my total score. It's a decline of over 10%. And these, remember, are the two best Pacifism players in the world as of this moment. The 5th best player, Evil Mask, has 1,010,568,025. Over 400,000,000 lower than the leader. The 10th best, Tyrak Stinger, has 807,120,000. The decline over the first 10 spots is more than 600,000,000 points. Compare this to what happens when you're further toward the middle of the bell curve. The player ten spots above me has 18,707,625 -- only 17,300 points more. The player who is ten rungs lower on the ladder than I am has 18,659,725 points. That's only 30,600 points less. It's a .1% drop from my score -- practically none at all. By contrast, the drop from the 1st ranked player to the 10th is more than 43%! What does this all mean? For one thing, it means that even if those Guitar Hero scores weren't fully on the level, the patterns we detected in them were still legit. The best of the best haven't just pushed the outside of the envelope, they've blown right past it and lived to tell the tale. The scary thing is that someone is going to top Windforce Azumo's ludicrous score. You can bet on it. After all, you don't have to score that highly consistently to set a record -- you just have to do it once. You just have to play the game of your life. Each person's personal ceiling is different, but I'm sure someone out there has the right stuff to blow past 1.5 billion, and probably even 2. I can't wait to see it happen. *Hilariously, over the course of writing this post I signed out and back into Xbox Live. In that time, I dropped from 15,236 to 15,304. So the numbers aren't exact. But they're close. Anyway, this is supposed to be fun. Got some good comments on yesterday's post about Geometry Wars 2 high scores, which led to some further thoughts on the subject. One thing that amazes me about almost every high score list is the distribution of scores. I don't know if they tend to fall exactly along a bell curve, but it seems like it. The bulk of the point totals always seem to be within shouting distance of one another. The very best players, though, are operating on another level entirely. The difference between the best Guitar Hero III player and the fifth-best Guitar Hero III player is nearly 150 million points! Another way to put it: the top player, vipen, is more than 20% better than the fifth, Eldar5150. The scores keep dropping from there, but they flatten out quickly. Look at how much further down the list you have to go to mark each subsequent 150 million-point increment. Now here's the really crazy thing. Judging by that short list above, you'd think that Just Lucky was no great shakes as a Guitar Hero player. He's barely 1/7 as good as the best player. If this were a head-to-head competition, it'd be a bigger blowout than Super Bowl XXIV. This is a game that has sold millions of copies. The high score list for campaign mode, expert difficulty, on the Xbox 360 version of Guitar Hero III likely contains hundreds of thousands of names. Just Lucky is most likely in the top 1 or 2% of all players, without even factoring in the people who only play on lower difficulty settings, and don't qualify for the expert list. In all probability, Just Lucky rates even more highly than that. He's one of the best in the world. But he's not within striking distance of the number-one guy. I bring this up because it's inspiring and discouraging at the same time. Let's be honest: Your odds of being the best at a videogame are about equal to your chances of winning a gold medal at the Olympics. Sure, someone has to do it, but six billion others won't. Only a handful can compete. Why should you even try? Because it's astonishing, the heights to which we can aspire. People have been motivated throughout our history by the notion that certain feats, however unlikely, were still somehow possible. I see someone scoring over 700 million points in Guitar Hero and I think to myself -- wow, I didn't even know the mountain went up that high. *Caveat lector: Those scores were all accurate via the Guitar Hero website at the time of this posting, but when I went into the game itself to see if I could get a sense of how long the score lists are, they seemed completely different. Some of the same names were on there, but it was difficult to corroborate the lists. But since I'd already written 99% of the post, well, here you go. After my first session with Geometry Wars 2*, I was astonished to find that I'd taken over the top spots on all six leaderboards. Maybe, I thought, I had some preternatural ability at this game. At long last, I'd found the one thing I was put on this earth to do -- the one thing I could do so well, I could rightly call myself the baddest man alive. I probably don't need to mention that, at the time, only two people on my friends list were actually playing GW2. And, no, I didn't really think I was some sort of top-down shooting savant. The lack of competition suited me just fine. When I mentioned, both on Twitter and on a message board, that I was perched comfortably atop my leaderboards, naturally I ignited some competitive fires and received several friend requests. In short order, I'd been put in my rightful place. Now, one of the fun things about Geometry Wars 2 is that your score seems to increase exponentially as you pick up multipliers. Destroying any given enemy is worth more points the deeper you progress into a game. As more and more foes show up, the faster your score ratchets up. It takes about as long to go from 0 to 100,000 points as it does to get from there to 1,000,000. Even so -- I cannot freaking believe these scores. People are insane. My top score in Evolved mode, which is the classic style, is a shade over 9,000,000. As of my last session, the number-one player on my leaderboards had clocked a cool 33,000,000. That was on Friday. I expect to see 9 digits when I log on later tonight, now that people have had a whole weekend to grind me into pulp beneath their shoes. I had still been pretty competitive in Pacifism mode, with over 14,000,000 points. According to commenters on a related MTV Multiplayer post, at least one videogame Chuck Yeager has already broken 1,000,000,000 points. If your eyes glaze over at the sight of so many zeroes, as mine do, that's a billion. Here's the surprising thing: this is killing me. I really enjoyed occupying the top spot of a randomly selected subset of geometric warriors. It was easy enough to ignore the little numbers indicating my place in the entire Geometry Wars hierarchy, as long as the large-print friends list looked so tasty. Now? My fallibility has been confirmed. I have long insisted that high scores and head-to-head gameplay don't interest me. I'm a tourist. I play games to participate in a narrative, to travel through new worlds and partake in innovative interactive experiences. High scores are a relic of a bygone era. I'll just admit it now: I say those things because I'm not very good at video games. Or, at least, the gulf in ability between me and the best players is so vast as to be untraversable. Usually, I like to think I'm at peace with this. It shouldn't affect my enjoyment of a game. The strange thing is that in this case, it's making it more fun. Geometry Wars 2 would probably be a blast on its own, to some degree, but the emphasis on competing high scores is what makes it impossible to put down, even for a hopeless case like me. I don't expect I'll get the top spots back any time soon -- okay, or ever -- but I'll be damned if I don't claw my way up at least a little bit. Or I could delete everyone off my friends list, buy a big foam finger, and parade around shouting "I'm number 1!" But what use is it if no one can see? *Can we clear this up? 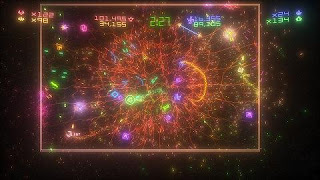 Is it Geometry Wars 2 Retro Evolved, or is it Geometry Wars Retro Evolved 2? Or can we just call it Geometry Wars 2 and leave it at that?